The art of marketing has certainly evolved due to advancements in technology and the internet. What was primarily an aesthetic-based concept in decades past has now become increasingly intertwined with quality content and requires eliciting the emotions of readers and viewers in order to be successful. Most marketing ploys these days revolve around a story – whether it is an infographic or an essay, the goal is to tell a story that inspires, provokes and entertains the reader. Many marketers find their strategies without success, and this is primarily due to a lack of a few essential components in their marketing stories. Below, we will cover some of the most important elements you need present in any marketing attempt. All too many marketers make the mistake of portraying their business or organization as the hero or protagonist in their marketing efforts, when in reality, you need a more personal element in order to stir emotion. In many situations, those who are pinging for SEO via marketing content will build a story around a normal character who finds his or her way and makes a huge difference in the world by the end of the story. Nobody wants to read a long, drawn out discussion of your product. You can reference and incorporate it, however, into content that tells an actual story of passion, change and success. In order to bring the story into sharper focus, you will need to first determine the objective or goal of the story. What is the protagonist attempting to accomplish, and how will he or she make it happen? This is often overlooked by amateur marketers who simply want to write a generic story that does more to plug a product or service than it does to inform or persuade. Your goal (outside of the story) should be to casually paint a more positive image of your brand, but you can only do this if you have your readers’ attention. What is the driving force that is preventing the changes that the protagonist wishes to make? If he or she wants to start an orphanage, what stands in the way of this manifestation and how does the protagonist overcome it? A story without a challenge is not much of a story – readers want to feel motivated and on the edge of their seats. Otherwise, your marketing story will read more like a manual: “person wants to accomplish this and does so without any problems” is not a very compelling read. The roadblock can also be thought of as the antagonist, or the person or object that seeks to thwart the protagonist’s progress. 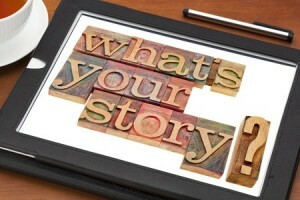 In summary, your marketing story needs to read like a real story. You will want to have plots, characters, objectives and obstacles that all tie into one another in order to engage, motivate, persuade and elicit emotion from the reader. Without these objects, you are just pinging for SEO. Maybe you will pick up a few backlinks along the way, but you’ll do little in terms of effective marketing persuasion without these aforementioned elements.